Blatant violation of the Supreme Court order on bursting of crackers saw the air quality in Delhi deteriorate drastically to 'hazardous' category on the morning after the festival of lights. Most of the areas in Delhi fell under the 'hazardous' category with the air quality index going above 900 in many centres. The Air Quality Index (AQI) readings of Major Dhyan Chand National Stadium; ITI Shahdra, Jhilmil Industrial Area; PGDAV College, Sriniwaspuri; Mother Dairy Plant, Parparganj; Mandir Marg and Anand Vihar showed 999, the highest measurable figure on the AQI. While AQI of Chanakyapuri is at 459, R.K. Puram recorded 752 as of 8am. The other numbers include, Okhla-696, Satyawati College-969, Dwarka-387, Mundka-509 and ITI Jahangirpuri-403. It has been advised that everyone should avoid outdoor activities to the maximum to avoid exposure to harmful pollutants. 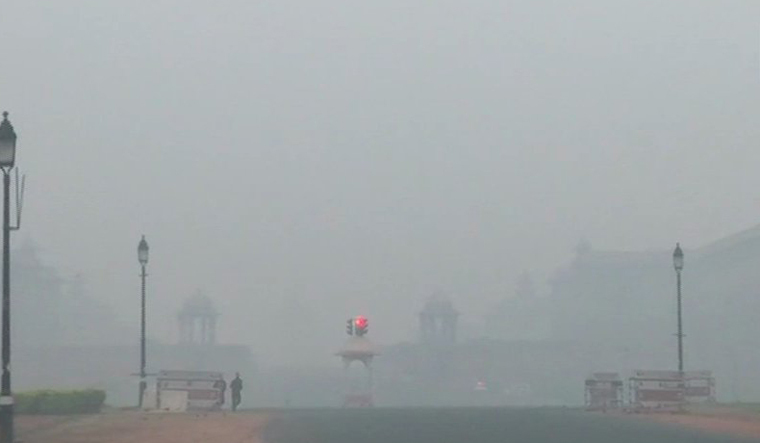 A thick layer of smog engulfed Delhi late on Wednesday and early on Thursday. The air quality deteriorated overnight from "very poor" to "hazardous" category as Delhiites continued to burst Diwali firecrackers long after the deadline set by the Supreme Court. The overall AQI recorded at 11pm on Wednesday was 302. Admitting "sporadic" breaches of the Supreme Court order on bursting Diwali crackers beyond the time frame of 8pm to 10pm fixed by it, senior Delhi Police officials said, "We are monitoring the situation." "There have been sporadic cases of violations. In some areas, people have been found burning firecrackers beyond 8pm-10pm time frame. The exact number of violations is yet to be ascertained. But, we will take strict action against them," said a Delhi Police official. The Supreme Court had allowed bursting firecrackers only between 8pm and 10pm on Diwali, while permitting manufacturing and sale of only "green crackers" with low emission of light, sound and smoke. The Supreme Court had asked police to ensure that there was no sale of banned firecrackers and in case of any violation, the station house officers of the police stations concerned would be held "personally liable". Some of the areas where the people were seen bursting Diwali crackers beyond the Supreme Court-stipulated time frame included Mayur Vihar Extension, Lajpat Nagar, New Delhi's Lutyens Zone, IP Extension, Dwarka and Noida-Sector 78. The intensity of the crackers burst before 8pm, however, remained low. But as the Diwali festivities picked up, the faint echo of crackers started growing louder. Bursting of crackers beyond 10pm was reported from areas like Mayur Vihar Extension and many South Delhi localities. The overall air quality index was recorded at 296 at 10pm after the Supreme Court deadline to burst crackers came to an end.